Oct. 30, 2013, 2:41 p.m.
By Caroline O’Donovan @ceodonovan Oct. 30, 2013, 2:41 p.m.
A year ago, Ze Frank — Internet “virologist,” creator of the beloved the show with zefrank, and online video pioneer — was tapped to head BuzzFeed’s video department, based in L.A. Since then, Frank has been striving to create video content with the same impossible-to-ignore qualities that BuzzFeed’s lists have become known for. 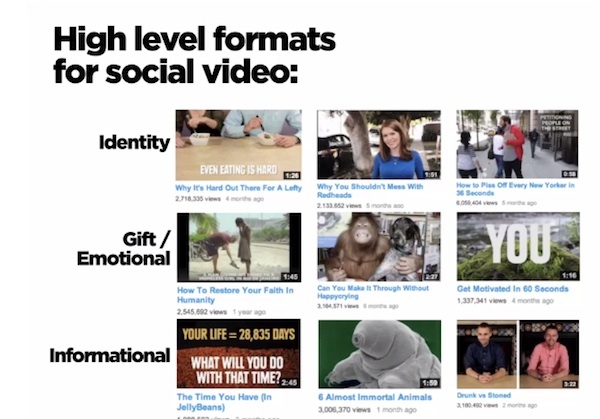 With 2.5 million subscribers and around 500 million views, Frank has made some progress, and in a webinar last week, he attempted to describe the elements of social video, both in terms of how to create the content and how to release it into the world. 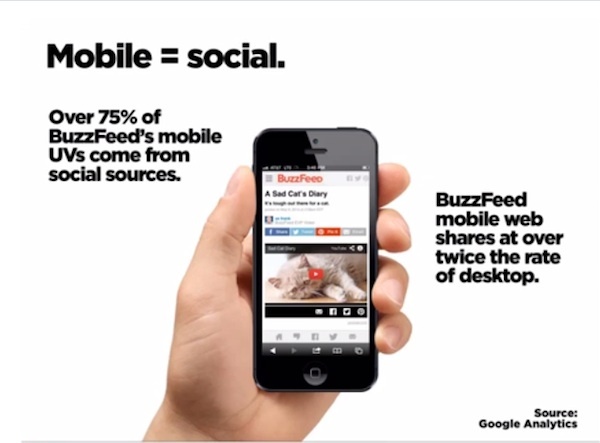 At its base, BuzzFeed Video is doing what we already know news companies also want to do with digital video — harness the combined power of social and mobile. There’s opportunity in the video news space, and it’s a safe bet that BuzzFeed will aim for a piece of it. For example, if you know somebody is going through a hard time, you might want to share with them a video called “How to Restore Your Faith in Humanity” — that’s emotional content. If you’re trying to show a friend from New York, in Frank’s words, “I know you, I like you,” you might want to show them, “How to Piss Off Every New Yorker in 36 Seconds” — that’s identity-based content. And finally, there’s informational content, which is often shared via what Frank calls the humblebrag — you share “Drunk vs. Stoned” to show you know a thing or two about being drunk, stoned, or both. The content piece, however, is only one element of the larger ecosystem in which we share media. Creators of shareable video must also consider the network, be it YouTube, BuzzFeed.com, Facebook, Twitter, Tumblr, or beyond. Frank said these are more complicated than we think. Only 10 percent of BuzzFeed’s video views come from YouTube subscribers, and only 6 percent come from BuzzFeed itself. Figuring out the nuances of where the rest of the audience is coming from — for example, that Facebook is a better sharing tool for emotional content while Twitter is better for informational content — is essential. 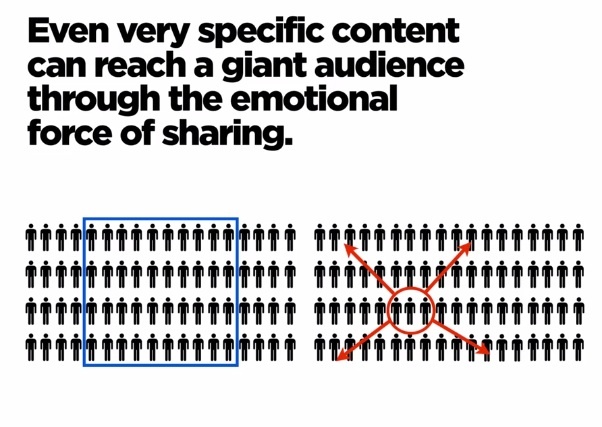 Chunking your audience into smaller groups might seem counterintuitive to video producers used to creating content with mass appeal. But if you create video content with “emotional force…strong enough that people will be motivated to share it with others,” your audience becomes “almost unlimited,” he said. That, in a nutshell, is the promise of social video. Much of BuzzFeed’s video content can still seem off-voice to regular BuzzFeed readers, and it’s certainly still not what the brand is known for. But video provides a major revenue opportunity for all online media companies, especially those already expert in getting eyeballs on their content. At the end of the day, BuzzFeed wants to be the expert in social content, no matter where it lives — on your phone, your tablet, or your desktop — or what shape it comes in. Slideshow images by Ze Frank. POSTED Oct. 30, 2013, 2:41 p.m.
O'Donovan, Caroline. "“We’re still babies at it”: BuzzFeed Video’s strategy relies on identity, emotion, and sharing content as communication." Nieman Journalism Lab. Nieman Foundation for Journalism at Harvard, 30 Oct. 2013. Web. 20 Apr. 2019. O'Donovan, Caroline. "“We’re still babies at it”: BuzzFeed Video’s strategy relies on identity, emotion, and sharing content as communication." Nieman Journalism Lab. Last modified October 30, 2013. Accessed April 20, 2019. https://www.niemanlab.org/2013/10/were-still-babies-at-it-buzzfeed-videos-strategy-relies-on-identity-emotion-and-sharing-content-as-communication/.